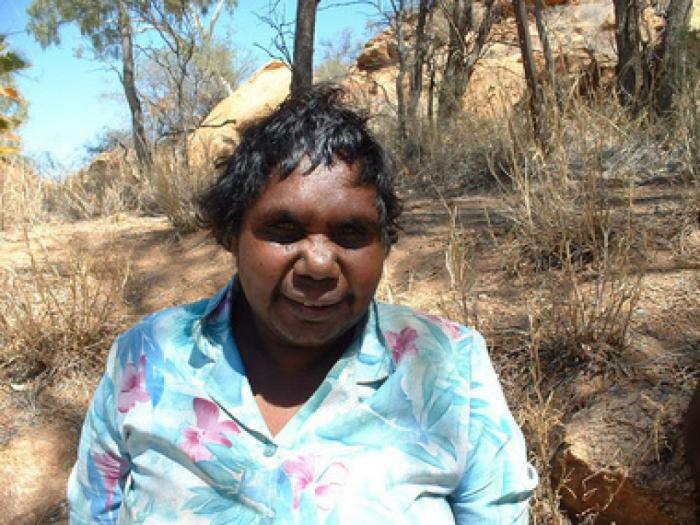 Anna Pitjara (Petyarre) was born about 1965 in Utopia (Eastern Desert) and belongs to the Anmatyerre language group. She is the daughter of Glory Ngarla and the niece of the famous Emily Kame Kngwarreye (1910-1996). Anna is one of the most sought-after young Aboriginal artists of the moment. Like other Aboriginals in Utopia, Anne began using the batik technique, but since the introduction of the new medium of acrylics and canvas in Utopia in the 1980s she devoted her life entirely to painting. She was initially taught by Gloria Petyarre, but later also learned from other female artists in Utopia. The topics Anna paints are based on the Dreamings of her father and grandfather. They are mostly related to the yam-plant, an important food source for the Aboriginals. Other important topics in Anna's paintings are wild flowers, the emu (a type of ostrich), wild potato and certain meeting places. Moreover, Anna often participated in ceremonies, where she painted the bodies of the dancers. These body paintings, mainly during women's ceremonies, are also often reflected in her work. Regarding Anna’s style, in her early work she used bright, vivid colors and applied them in a linear dot-painting style. Later we see her dot-work develop into more complex patterns, sometimes with only little color. The Wild Yam Dreaming painting is an impressive example of her proficiency in working with accurately placed, drop-shaped dots that create a wavy dynamic scene.